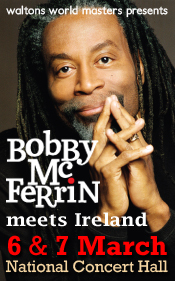 PERFORMERS ANNOUNCED FOR BOBBY MCFERRIN MEETS IRELAND! The quality and variety of entries made it extraordinarily difficult for our adjudicators – both from the Waltons World Masters Series and Bobby’s creative team in New York – to make their final selections for the Bobby McFerrin Meets Ireland events at the National Concert Hall on Wednesday & Thursday, 6 & 7 March, but we have them at last! Click here to read details of artists selected. We would like to thank all of the wonderful performing artists who applied to participate, and while we could only choose a very small number, it was a pleasure and privilege for our adjudicators to witness the quality and diversity of performers working in Ireland today. Announcement of Bobby McFerrin Meets Ireland participants delayed until Monday! We know that the musicians and dancers who applied to participate in the Waltons World Masters – Bobby McFerrin Meets Ireland events on March 6th and 7th at the National Concert Hall are impatient to hear whether or not they have been selected, but the sheer quality, quantity and variety of entries from all over Ireland have made it extraordinarily difficult for the adjudicators – both from the Waltons World Masters Series and Bobby’s creative team in New York – to narrow down the field and make their final decisions. For this reason, they have asked us to delay the announcement of performers until Monday, 11 February, rather than today. TICKETS FOR BOBBY MCFERRIN FOR VALENTINE’S DAY! Make someone smile this Valentine’s Day with tickets to the phenomenal Bobby McFerrin (of ‘Don’t Worry Be Happy’ fame). Presented by Waltons World Masters, Bobby McFerrin Meets Ireland is going to be the event of the year in the National Concert Hall on the 6th & 7th of March, when he will collaborate over two evenings in ‘in the moment’ performances with a very select group of Irish artists representing the best of creativity in Ireland today. To book tickets, starting from €25 (with 10% discount for New School students), go to NCH.ie.